P. glabra Adr. Juss., designated by J. Hutchinson, Gen. Fl. Pl. 2: 589. 1967. Shrubs, subshrubs, or vines; vegetative hairs medifixed and mostly stalked, the stalk nearly or quite absent in a few species; stipules interpetiolar (borne on stem beside petioles), much enlarged, each pair of stipules from opposite leaves connate to form a large cordate structure, with the 2 stipule-pairs at each node acting as valvate bud scales enclosing the vegetative tip or the 4 flower buds of an umbel until they emerge, eventually deciduous and leaving wide scars across the node; leaves decussate; petiole eglandular; lamina bearing glands on abaxial surface between midrib and margin. Inflorescences terminal and/or axillary, with flowers borne in umbels of 4 (8 in P. octoflora), the umbels variously grouped in compound inflorescences; pedicels usually sessile, short-pedunculate in P. octoflora; bracts and bracteoles absent or (usually) present and persistent but very small. Sepals valvate and concealing petals in enlarging bud, recurved or revolute in anthesis, the anterior sepal eglandular, each of the 4 lateral sepals bearing 2 large abaxial glands on the free part of the sepal; corolla bilaterally symmetrical, the posterior petal with a thicker claw than that of the lateral petals and a limb that is usually somewhat to much smaller; petals yellow, glabrous, fimbriate or denticulate on the margin and sometimes capitate-glandular; androecium bilaterally symmetrical, glabrous, the filaments connate at base; 5 stamens opposite petals fertile, each anther with a prominent glandular connective (absent in P. anadenanthera); 5 stamens opposite sepals sterile, each bearing a large multicellular apical gland (a modified sterile connective); pollen cuboidal, globally symmetrical, with colpi not perpendicular to the equatorial plane and pores variously distributed; receptacle glabrous on both sides of stamens; gynoecium bilaterally symmetrical, comprising 3 carpels completely connate in ovary, all fertile; styles 3, the anterior more or less different from posterior 2 in length, thickness, and stance; stigmas usually terminal and capitate, in P. jussieuana and P. magnifica the stigma of the anterior style oblong and borne on the abaxial surface at the apex of a long, strongly curved style. Fruit dry, breaking apart into 3 velutinous samaras borne on a pyramidal torus; samara bearing a large dorsal wing with the adaxial margin thickened and ± bent backward and the veins bending away from it toward the thinner abaxial margin; nut usually bearing 2 much smaller lateral winglets, one on each side, the winglets absent or much reduced in P. hatschbachii; cartilaginous carpophore extending on underside of nut from receptacle to outer edge of nut; embryo with obspatulate unequal cotyledons, the outer cotyledon larger and folded over the inner one. Chromosome numbers: n=10 (P. glabra, P. hispidula); 2n=30 in the apomictic species P. reticulata; see discussion below. Peixotoa is a member of the large Stigmaphyllon clade (Davis & Anderson, 2010 [pdf]), most of whose genera have fruits breaking up into samaras with a large dorsal wing thickened on the adaxial edge; such samaras are found only in the Stigmaphyllon clade. Those samaras have a cartilaginous carpophore connecting the nut to the receptacle, another synapomorphy peculiar to this clade. The carpophore is retained in most members of the clade, but is rudimentary or absent in plants that have abandoned wind dispersal, e.g., Aspicarpa spp. Within the Stigmaphyllon clade, most subclades (but not Stigmaphyllon itself) have terminal, often capitate stigmas. All of those characteristic features are present in Peixotoa. There are two sister subclades in the Stigmaphyllon clade that have the ancestral androecium of ten fertile stamens reduced, but the reduction has happened in different ways in the two subclades. In the Aspicarpa subclade the reduction has occurred in the stamens opposite the petals, first in the four stamens opposite the lateral petals, then in the stamen opposite the posterior petal. In the Peixotoa subclade (Peixotoa, Cordobia, Mionandra, and Gallardoa) the reduction has come in the five stamens opposite the sepals, all of which are sterile. Peixotoa is readily distinguished from the other three genera in the subclade by characters of the stipules, inflorescence, and androecium. In Peixotoa the stipules are greatly enlarged and function like bud scales, while in the other genera they remain small; those large stipules and the scar they leave when they fall provide an excellent way to recognize Peixotoa even when the plants are sterile. The inflorescence consists of 4 (8)-flowered umbels in Peixotoa, while in the other three genera the flowers are borne singly. Finally, the sterile stamens in Peixotoa bear enormous apical glands; in the other genera of the subclade the staminodes are much reduced and bear no glands. C. Anderson (1982, pp. 9–11) presented observations suggesting that apomixis occurs in five species of Peixotoa (P. axillaris, P. leptoclada, P. octoflora, P. paludosa, and P. reticulata, the latter being the most variable and widely distributed species in the genus). Anderson's evidence for apomixis, which she admitted was only preliminary, consisted of high rates of pollen abortion, anthers that do not open, and unusually high rates of fruit set. She also cited work by W. R. Anderson showing that in one specimen of P. reticulata (Anderson 11890) the chromosome number was 2n=30, with meiosis highly irregular (see W. R. Anderson, 1993a). Peixotoa offers a good subject for study of breeding systems, cytology, and hybridization in a group of closely related species, but to do that properly one would need to be resident in the Planalto of Brazil. References: C. Anderson, 1982, revision, and 2001b, new species. Etymology: Jussieu named Peixotoa in honor of Domingos Ribeiro dos Guimarães Peixoto (1790–1846), a Brazilian who studied medicine in Paris and then had a distinguished career as a physician in Rio de Janeiro. 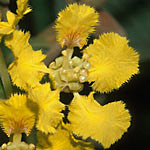 Uses: None known, but the large flowers make these plants very showy and they are occasionally cultivated in gardens.